The hijacked narrative out of Columbus definitively declares that Sergei Bobrovsky is better than Steve Mason, and by a long shot. Obviously, there’s a lot to like about Bobrovsky, so their ongoing honeymoon with their franchise goalie is understandable. But a closer look at the two may do away with the notion that the young man they call, “Bob,” is superior to the Flyers’ top backstop. At first glance, it’s easy to let the personal statistics and accolades sway the opinion between the two in Columbus’ direction. Since being traded to Columbus, Bobrovsky has gone onto post a 63-39-12 record. Bobrovsky’s .925 save percentage, and 2.30 goals against average through 115 games with the Blue Jackets have been spectacular. And it didn’t hurt the 26-year-old Russian’s rise in popularity when he collected the Vezina Trophy in just his first season with the Jackets. In regard to the current season, the two are still eerily similar. Despite Mason’s misleading 5-9-4 record, the 6-4, 217-pounder’s save percentage of .917 is a strand of a hair lower than Bobrovsky’s .919 mark. But with both goalies appearing in 19 games, and Bobrovsky’s added 32 shots seen, the numbers do, in fact, suggest Bobrovsky is better – even if it’s by the slightest of margins. After suffering a 5-2 defeat in Los Angeles on Oct. 26th, Bobrovsky would go onto miss the team’s next eight games due to a broken finger. The Jackets clearly didn’t fare well in his absence, losing seven of those eight games. And after returning as quickly as possible, Bobrovsky’s five losses in his first six games back could easily be attributed to shaking off the effects of the injury that initially sidelined him, along with the quality of competition he faced throughout that span. Four of the five teams that defeated Bobrovsky after his return are currently sitting in position to make the playoffs. But let’s not make excuses for the former Vezina winner. After downing the Sharks with 36 saves in his first game back, Bobrovsky was horrendous in his stretch of losing five straight. Man, just an awful game for Bobrovsky. That first goal was just a killer. Bobrovsky blew a two-goal third period lead at home against Boston on Nov. 21st. The late-game collapse was sparked by an embarrassing goal allowed from center ice off the stick of Dennis Seidenberg. Columbus would somewhat bail Bobrovsky out that night, salvaging a point in a shootout loss, but it wasn’t even one of the three games in November that Bobrovsky would surrender four or more goals in. 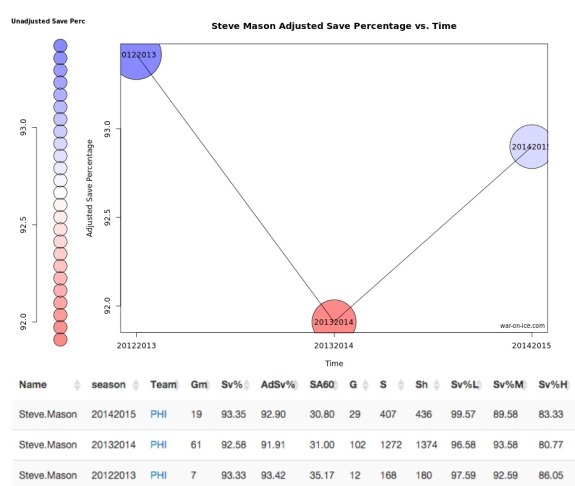 It hasn’t been a stark contrast for Steve Mason, though, through 19 games. The former Blue Jacket was victimized for four or more goals in three of the Flyers’ first five games. And after being relieved by Ray Emery for the team’s first win of the season in Dallas on Oct. 18th, it would be Emery – not Mason – who would go onto rattle off four straight wins to push the Flyers ahead of the Jackets in the standings. Aside from those facts, though, both goalies have been terrific. Bobrovsky has since emerged with a five-game win streak, including a 52-save performance in Sunrise on Dec. 4th – a win Bobrovsky would steal in Columbus’ first shootout win of the year. But while Mason may not have as many wins, he’s been equally impressive when his team’s play in front is welcomed into the discussion. Mason’s struggles on the surface do not reflect his 46-save regulation shutout loss to the Islanders on Nov. 24th, and are not a representation of the fact that he’s given up two or fewer goals in five of his last nine games. Regardless, both Mason and Bobrovsky are being asked to save their respective teams who are separated by a single point near the bottom of the Metropolitan Division. The overall numbers are close to identical. But are there other factors that can wedge a gap between the two to factually announce who is truly better? Individual statistics can be misleading at times. That’s not to discredit the numbers either of these goaltenders have brought to the table since they were traded. But even with the minor details of the comparison favoring Bobrovsky, the stats between the two are, again, close in proximity. Both are one-time 30-game winners for their current clubs, while the two have now finished ahead of each other in Vezina Trophy voting. And yes, that’s despite the fact that – unlike Bobrovsky – Mason has yet to win the award, should he ever. Both led their team to the playoffs last season – winning their first career playoff games in their second post-season appearance – and both were unable to reach the semi-final round. Both have been on the wrong end up extenuating circumstances this season. Bobrovsky was one of the many injuries that has ravaged Columbus, even with Bobrovsky back now. Mason has been asked to steal games for a team with skaters taking turns in the press box, and one that spends a vast majority of their games in their own end. And despite owning that one point edge in the standings, the Flyers have scored 45 goals for Mason, while the Jackets have given Bobrovsky 47. If measuring basic stats illustrated the entire picture, however, there’d be nothing further to discuss. But since not all goals against are the same, the basic statistics give a preview of the entire whole. For example, basic save percentage statistics include time shorthanded, which in turn, leads to a greater probability of allowing a goal. This sort of logic leads to the adjusted save percentage for goalies. From a quantitative standpoint, we understand the game better now than ever before. We understand shot attempt differential, which we know we can be used to approximate possession. We call this corsi, and we understand this to be a key component of overall team success. We can also begin to isolate the impact a player has on their team’s shot attempt differential, which is a solid representation of strong two way play. The charts provided below measure Bobrovsky and Mason in five-on-five situations throughout the entire time spent with their current team. Their eight playoff games were excluded, but that omission works to Bobrovsky’s advantage. Although Bobrovsky’s adjusted save percentage is consistently lower than his unadjusted percentage, it has yet to dip under a single percentage point in all three seasons. And while that is, in fact, a strong showing, both save percentages are trending down since his lockout-shortened Vezina season in 2013. Since Bobrovsky appeared in 38 games in 2013 to Mason’s seven, the sample size is skewed. From 2013 to the present, however, Bobrovsky’s decline is seen in every category except shots faced per 60 minutes and medium-danger save percentage. Mason’s breakdown shows just how deceptive his current 5-9-4 record is. Furthermore, it shows just how close Mason is to Bobrovsky. Especially when the disproportionate “first seasons” are weighed as equally as possible. Mason’s current edge in high-danger and low-danger save percentages have been posted while playing for a Flyers team that is similar in the Corsi department as Columbus. In other words, these past two seasons are the closest we’ll probably see to this observation being pound-for-pound. With the Blue Jackets now a divisional rival, this discussion is far from over. Against each other, Bobrovsky holds a one-game advantage, which includes a 37-save shutout last April. After last week’s overtime loss in Columbus, Mason is now 1-1-1 when matched up against the former Flyer. Whether or not you consider Bobrovsky to be better than Mason by a long shot is up to you. If you do, that’s fine. The intent of this piece isn’t to denounce Bobrovsky’s talent. But based on what’s been provided, perhaps it’ll give cause to view Mason in a different light. Mason may not have a Vezina Trophy, but Bobrovsky doesn’t have a Calder Memorial Trophy either. And while each individual walks a different path throughout his career, judging Mason based on his time with an abysmal Columbus team reeks of vicious fan hood. It is what it is. These two are a lot closer than most think or acknowledge.